The main screen for an Activity is not the only way to interact with the user of an app. A brief message or dialog can be displayed in appropriate circumstances to ask a specific question, get specific input, or show a brief message. Android has build in support for such small focused interactions that require immediate attention. The Toast class – to display brief informational only message. AlertDialog – supports buttons (from zero to three), list selections, check boxes and radio buttons (see the article About Box in Android App Using AlertBuilder). ProgressDialog – supports a progress bar or wheel and supports buttons because it extends AlertDialog. DatePickerDialog – supports selecting a date. TimePickerDialog – supports a time selection. The PopupWindow class – allows a View to float on top of an existing activity. Suitable for custom informational messages. "This class represents a popup window that can be used to display an arbitrary view. The popup window is a floating container that appears on top of the current activity." 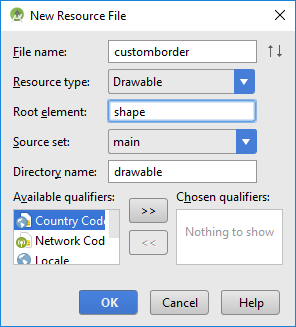 Add the code to load and populate the pop-up window. For this example a pop-up is going to display a game’s result as gold, silver and bronze medal positions. 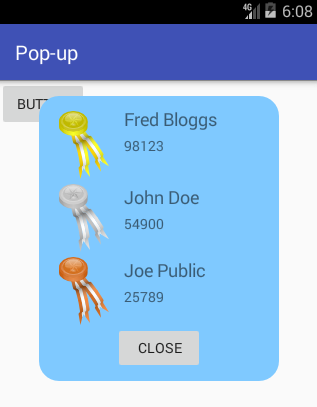 The pop-up will have a graphic, shown in a ImageView, for each of the medals; a TextView for the winner’s name, and one for the score. The images for the medals came from the Open Clip Art Library by user momoko. They have been resized for the Android project and are available in medals_png.zip. Ready to download and add into the app project. The button on the pop-up is given an OnClickListener so that the pop-up can be closed (if not familiar with coding event handlers see the article Different Ways to Code Android Event Listeners). Bookmark this page in your browser so that you can use the code as a template for future projects that require a pop-up. For more android example projects see the Android Example Projects page. The medal images are also available via the Free Launcher Icons, Menu Icons and Android Graphics page.